Albuquerque, NM — An undercover investigation of the Southwest’s largest so-called “women’s clinic” has revealed that the purpose of this clinic is not to provide women’s healthcare at all, but to sell women one product – abortion. In fact, the only option given to women at the misnamed Southwestern Women’s Options in Albuquerque, New Mexico, is abortion. Period. So many times people criticize pro-life activists for focusing attention on local abortion clinics, citing the many other services such clinics provide. However, at Southwestern Women’s Options, a clinic that specializes in lucrative third trimester abortions, there are no other services. 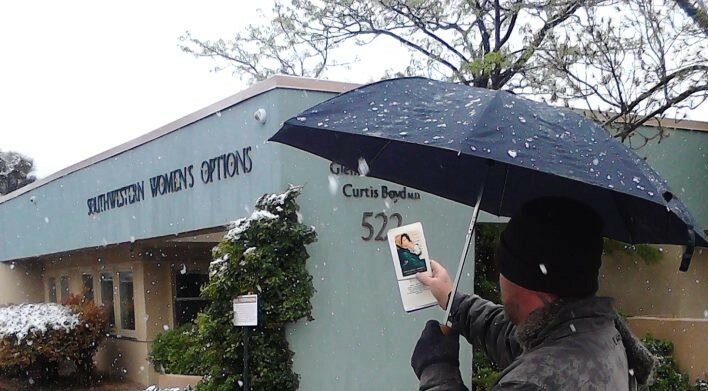 Here in Albuquerque, as we reach out to abortion-bound women outside of this late-term abortion clinic, women give us all kinds of reason as to why they are going inside. “I’m having an ectopic pregnancy removed,” “I’m here for an IUD,” “I’m getting birth control,” “I’m here for a mammogram,” “I’m here for a well woman exam,” or “I am here for STD (sexually transmitted disease) testing” are the excuses we hear from women entering the clinic on an almost daily basis. Very few women actually admit to going in for an abortion to kill their child. When asked whether or not annual well women’s exams like pap smears are offered, the answer again was, “No.” When asked if they screen for sexually transmitted diseases, the answer once again was no. Most disturbingly when asked if an ectopic pregnancy can be seen on ultrasound at SWO, the answer was, “No.” This fact alone is troublesome because these types of pregnancies can be life threatening. In fact, the employee of SWO that we conversed with indicated that her ultrasound machine was so outdated that it was incapable of diagnosing an ectopic pregnancy. If a woman was experiencing an ectopic pregnancy, she told us that their facility wasn’t equipped to handle that kind of thing. “That requires a surgical site to do that,” she admitted, even though the abortions done at the clinic where she works do surgical abortions all day long. Was she admitting that her facility wasn’t properly equipped to properly handle surgeries and the complications that might develop from them? We think so, and have documentation to support it. Project Defending Life has documented 14 abortion injuries since 2008 at SWO. The most recent abortion related injury occurred on March 1, 2013. Life-threatening complications suffered by these women range from hemorrhage, to incomplete abortions where baby body parts were not completely removed, to a ruptured uterus during a 35-week abortion. To further show that money is a motivating factor behind the abortion industry, a previous undercover investigation of SWO revealed that late-term abortions on perfectly healthy babies and babies diagnosed with Down syndrome cost anywhere from 8-16 THOUSAND DOLLARS. In fact, the taxpayers of New Mexico foot the bill 100% for these abortions via Medicaid. 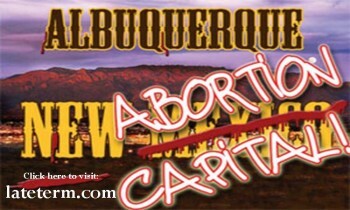 In 2011 alone, New Mexico Medicaid paid for 1,786 abortions at a whopping cost of $1,127,557.26 to New Mexico taxpayers. Healthcare is defined as “the field concerned with the maintenance or restoration of the health of the body or mind,” however, abortion does neither. Abortion doesn’t restore the health of the woman’s body nor in our vast experience with post-abortive women, does abortion restore the mind. In fact, the procedures employed during an abortion do just the opposite. For instance, the suction within the uterus during a first trimester aspiration abortion can be damaging to the uterine wall. The second trimester procedure requires that the pre-born child be pulled apart piece by piece with grasping instruments, which sometimes results in an internal organ being grabbed instead of the child. The third trimester procedure is essentially an early induced labor, after the pre-born child has been euthanized via a fetal heart attack. The drug combination and other aspects of this horrific practice bears many risks to the woman. Abortion certainly doesn’t heal the minds of women either; in fact many post abortive women testify that mentally they are in turmoil after their abortions for many years. Abortion isn’t healthcare. It provides no benefit to anyone, woman or child, except for the abortionists and their bank accounts. The New York Times recently published an article “The Holocaust Just Got More Shocking,” that described the Nazi “care” centers that committed unspeakable atrocities on women, including abortions, which sound eerily similar to our modern day American women’s health “care” clinics. Should these types of clinics receive public money when they do not offer basic healthcare and in fact, have the potential of harming the health of unsuspecting women? We think not. The lack of basic medical care provided to women at clinics like Southwestern Women’s Options and the staggering number of documented abortion injuries, not just in Albuquerque, but nationwide, should motivate all of us to be even more diligent to offer help to abortion-vulnerable women, especially at the abortion clinics themselves, because it seems that the only ones who truly care about the health of women — body, mind, and soul – are those of us outside the walls of American abortion clinics. We Must Never Shirk Back, Even In The Face of Seemingly Insurmountable Odds! On March 8, 2013 myself (Tara Shaver) and Evie Jilek, general counsel for Project Defending Life, met with the city of Albuquerque’s District Attorney, Kari Brandenburg. This meeting was one of many we have recently held with various leaders throughout the state. In light of the tremendous amount of abortion injuries at local clinics, our concern is for the safety and health of women seeking dangerous third trimester abortions. When presented the facts, DA Brandenburg seemed very concerned as well. In this conversation I think it was beneficial to converse women to women about such a delicate invasive procedure. As women, we understand each other and share a common concern for one another that crosses all perceived differences of opinion. Abortion really is, at any gestation, the greatest violation of the unique miracle that only women can experience. The reason for this meeting was to address the fact that there is a criminal abortion statute in NM [Section 30-5-1 NMSA 1978]. One of the things this statute mandates, is that post viability abortions are to be performed in an accredited hospital. Southwestern Women’s Options is not an accredited hospital but continues to perform these post viability abortions, which is one of the reasons why we continue documenting abortion injuries at a staggering rate in NM. 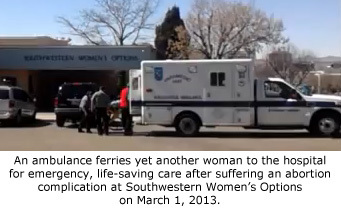 On February 7 and March 1 women were transported from SWO by ambulance to local hospitals. It only makes sense that if SWO is unable to handle emergency situations that arise from the dangerous late term abortion procedure, then they should not be allowed to be done where adequate help is not available. We asked the DA to enforce this statute in the interest of women’s safety. DA Brandenburg has agreed to look into the statute and potentially seek an opinion from the Attorney General to determine whether or not criminal charges can be filed. I was pretty encouraged by this meeting because for once a true concern for how these abortions are done and how they affect women was taken in to account, in fact both DA Brandenburg and her Chief Deputy were visibly horrified. We trust that the DA will look into this statute and are thankful for the opportunity to bring these concerns to light. As a community we can all stand together in the interest of protecting women, it is our hope that this will happen and that it won’t take a woman dying for everyone to wake up to what is actually happening here in Albuquerque. Within the Pro-Life community…“To use or not to use graphic images, that is the question.” My desire in contributing to this dialogue is not to cause division; while I personally use graphic images everyday as I sidewalk counsel and stand for life out at late-term abortion clinic Southwestern Women’s Options in Albuquerque, New Mexico I would never tell someone that disagreed with me that they had to use graphic images. I believe we should extend grace to those who choose not to. However, my experience is that those who do not use graphic images, they are not as gracious, in fact…they can be some of my harshest critics! The main reason that I use graphic images is because they restore meaning to the word abortion, they change minds, and they save lives. 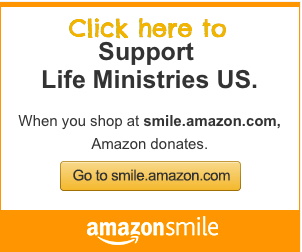 My wife, Tara Shaver, and I work with Project Defending Life (PDL) a Pro-Life ministry center in Albuquerque, NM that has a vast amount of resources for abortion minded women. I have a rare opportunity to be both out on the street referring women at the abortion clinic to PDL and inside PDL as my wife Tara counsels the women that we reach. My wife makes the point to ask the women what was it that changed their mind, time and time again the graphic images are what penetrated their heart and most contributed in saving their babies from abortion. This question is usually raised when large numbers of Pro-Lifers plan a major event. Most recently there was an article that surfaced around the March for Life, 2013 in D.C. titled: “Eight Reasons Not to Use Graphic Abortion Images at the March for Life,” by SimchaFisher . 1. There will be children at the march. I am sure there were children that witnessed Jesus being led through the streets of Jerusalem and at the foot of Calvary. Whether or not children would be present at the crucifixion did not deter God from choosing this graphic display to convict the world of sin, judgment and righteousness! 2. There will be post-abortive women at the march. There were murders, thieves and sinners at the foot of Calvary. In fact these are the very ones that need this sign (Christ being lifted up…to be drawn to Jesus John 12:32.) We are all sinners and need to be continually reminded of what of our sin produced…the death of Jesus! 3. Mothers will be there. Mary, the mother of Jesus, was at Calvary…enough said! 4. Those are real babies. Calvary was real too! In fact we need the truth about what Jesus experienced on the cross to become more real to us each and every day as we are tempted to sin! 6. They sometimes push women into abortion. (Personally, this is the most ridiculous! Women who go to abortion clinics are abortion bound, the only question is…”Is it possible for their minds to be changed or their hearts to be penetrated by someone who reaches out to them with compassion and the truth?”) Does Calvary push people to sin more…? I don’t think so! Calvary and its brutality is what penetrates the most hardened hearts! God knows best what convicts of sin, judgment, and righteousness…the brutality of the cross is it! 7. Desensitization is a real danger — even among pro-lifers. No matter how many times we see a cross and realize the implications of what Jesus endured we will never become desensitized to Calvary! In fact, God chose to leave us His Word to read daily and meditate upon moment by moment the implications of the cross! We should come to the foot of Calvary more often! Let it ever be before us! 8. People see what they want to see. When it comes to Jesus, people see what they want to see, however, may we never shirk back and fail to lead people to the foot of Calvary! The most loving sign the world has ever seen, was held by God Himself, that sign was His Son, Jesus the Christ, bloody and marred beyond recognition. This sign forever declared to the world our sin and draws those who are convicted out of darkness and into the light. (John 12:32) May our concept of love never be fashioned by the world or our own understanding. Our concept of love must be fashioned in light of the cross.